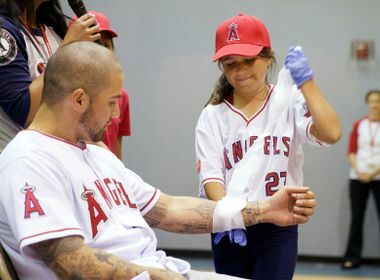 An Edison volunteer greets a young Angels' fan at the PrepareSoCal Day at Angel Stadium. Edison volunteers hand out rally towels to fans at the Angels game. Former president of SCE Ron Litzinger throws the first pitch. Edison International Senior Vice President of Corporate Communications Janet Clayton talks with an Angels' radio announcer about emergency preparedness. 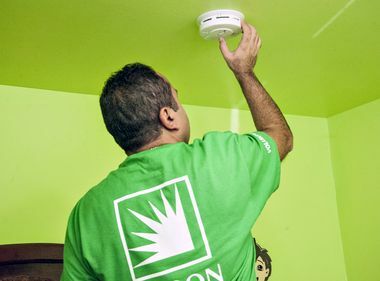 Southern California Edison President Ron Litzinger recently made a pitch for emergency preparedness — literally — in recognition of National Preparedness Month. From the mound at Angel Stadium of Anaheim on Sunday, he threw out the ceremonial first pitch to kick off PrepareSoCal Day. But it was more than just a baseball game. The afternoon showcased Edison International’s $1.5-million, three-year partnership with the American Red Cross and the Los Angeles Angels of Anaheim aimed at increasing emergency and disaster preparedness awareness among residents in Los Angeles, Orange, Riverside, San Bernardino and Ventura counties. Each fan at the game received a bright red “What’s Your Game Plan?” rally towel that can be packed in an emergency preparedness kit. In addition, Edison and American Red Cross volunteers staffed information tables where fans helped themselves to emergency preparedness guidebooks, an electrical safety fact sheet and emergency document holders. 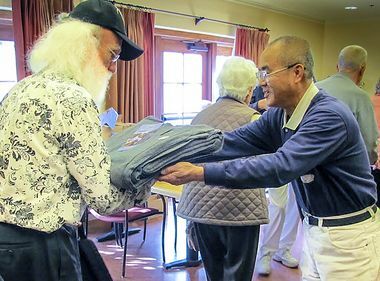 In Southern California, an area synonymous with the expected “Big One,” surprisingly few people — 6 percent — have taken the steps necessary to prepare for an earthquake or other unexpected disaster, according to the American Red Cross Los Angeles Region. Janet Clayton, senior vice president, Corporate Communications for Edison International and SCE, said waiting until a disaster strikes is not the time to start planning. The recent earthquake in Napa, she said, serves as a wake-up call to prepare now. “Sometimes, unfortunately, it takes what happened in Napa, when you see the news events, you think, wow, that could have been here,” she said. Use a sturdy, easy-to-carry container to hold items (backpack, duffle bag or large tote). Pack water (one gallon per person, per day; a three-day supply for evacuation) and non-perishable food items (three-day supply). Have a battery-powered or hand-crank radio (NOAA Weather Radio, if possible) and extra batteries. Have a first-aid kit, a seven-day supply of medications, spare glasses, or contacts and solution. Have extra cash in small bills. Pack a set of clothes and sturdy shoes for each family member. Pack sanitation and personal hygiene items. Keep a current list of family phone numbers and email addresses including someone who can be reached if local lines are down. For more preparedness tips, visit: preparesocal.org. Over the past three years, Edison International’s collaboration with the American Red Cross and the Angels has successfully built resilient communities that prevent, prepare for and are able to respond during life-threatening crises and disasters.